Caution: executing emule.exe adds a lot of Registry Keys for BHO and Autorun!!! Run CCleaner v2.09.600 - Slim or any strong regcleaner after moving this mod in another folder or rar it back to an archive!!! 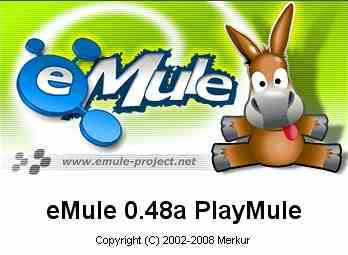 eMule v0.48a PlayMule Build 080624 edition is based on the original development of the open-source software. This version designed specifically for domestic users to download directly after the completion of the installation can be useed. Bid farewell to the past complicated settings. PlayMule the latest version of the built-in support VNN (allows users to each other transmission), shows that under the IP, UPnP automatic port mapping, and other functions, optimized for the actual use of a number of transmission parameters and use the most impartial of subsystems. Let uploaded to get the maximum opportunity to download. Under the Preview functions (support RMVB / RM, MKV format), provide the clearest and most fluent of the network movie. Just buffer 2-5 minutes can be fluent to watch on-line. It has a advanced Network Search ed2k, kad and verycd web. optimizing media players, to increase the player to display the progress of the download function. - eMule BHO IE2EM.dll (VeryCD.com) v1.0.0.1 / Fear not, the BHO is external and the dll can be deleted to prohibit the installtion event if do not run the installer as usually use the binary zip/rar. Folder $PLUGINSDIR can be deleted its from unpacking rest of the NSIS (7zip based) Installer.To set other Language such as English delete file in folder /lang/zh_CN.dll or use settings.